Hi loves! How are you today? Still a scheduled post so I am guessing once again I am doing fine ;-). Today I have a review for you for the Born Pretty Store Nail Art Pen. When I saw this product I got quite excited - I am not the most talented girl when it comes to nail art, and fine and thin lines are especially hard for me. This product looked like it could give me a more accurate application and therefore better looks! When I received the pen I liked that the handle is a bit thicker. It gives me more control over the "brush". The pen has a hard plastic tip, you have to shake the pen real good, then push down the tip on a hard surface a few times and the product will flow out. It did not flow out constantly, you have to push again and more will come. The color comes out very opaque which surprised me, and it dries quickly. If you do make a mistake it is removable with water! I wanted to recreate this look done by Pshiiit. 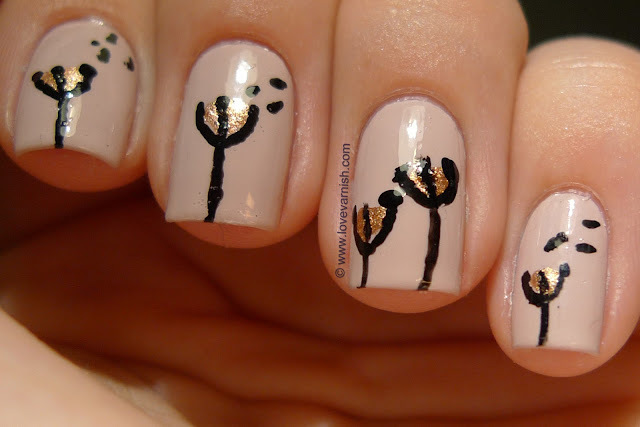 This was actually my initial "delicate print" mani for the 31 Day Nail Art Challenge! But because of this review I didn't use it for that purpose. Now, at first I was really happy with the pen. Nice flowy color, opaque application, easy to control. Until it stopped flowing. I can't get it to work anymore. I had done 4 nails and the pen was just like: "do it yourself lazy bish!". I have tried numerous times, fiddled with a needle thinking it might have got clogged or something, but the pen just won't work anymore! I am considering getting another and seeing if it was just 1 faulty pen, because I liked it a lot before it stopped working! It didn't smudge when topcoated, removable with water when you make a mistake, it is the perfect product for me! Have you ever tried this pen? And what other nail art pens do you recommend? I love the design you did! A cute re-creation! I tried their nail art pen, too and. Liked how opaque the color was and how it allowed me to draw thin detailed designs. I need to check if mine still works. Yes I was so sad when that happened! And thanks Natalie :). I hope yours still works, will you let me know? If it does I think I'll repurchase it because the opaqueness is amazing! Oh no! That's not good...but I like how opaque it is! Hopefully it was just a dud? Yeah I hope so, I'll be ordering another to try and see if it works better.